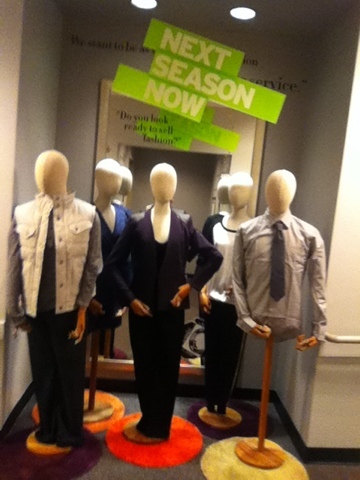 A Day in the Life of a Nordstrom Intern: It's Almost Over! Since I am halfway through the internship I figured I could recap some of my experiences and how much I've learned so far. It has honestly been a great experience so far and the best part is still yet to come, anniversary sale!! :) This internship has really opened me up to different opportunities that I never would have thought of before. Working for Nordstrom is truly an amazing experience. The employees are so appreciated by everyone else and everyone works as a team to provide the best possible service to the customer. I've never really seen customer service so "crazy" I guess I could say. I mean honestly, Nordstrom customers are valued so much that there isn't even a return policy, which in return is our number one selling tool. Nordstrom wants to gain the respect of every customer who walks through the door and its been great to be able to experience that, because no where else really provides that one on one relationship. Another thing that has been a real eye opener for me is working on commission. Being in a more competitive atmosphere has taught me a lot. I know now you have to treat every customer like its your last, because in reality it could be. You have to build your own business and keep you customer at the top of your priorities, as well as, build and maintain a relationship with them. Interning as a possible assistant manager has shown me both sides. I have learned a lot about how to become a team leader while still working on the sales floor. I am really glad that I was able to get this internship. It has opened new doors for me within the company. I will be sad to leave during the semester, but hopefully I will be going back the start of next year. Next week starts anniversary sale and I'm super excited to be a part of it. I'm very proud of where I am now as to where I was before, and I have grown a lot and can't wait to learn some more! Also, it is time to get next season's must have items right now!